While most people know Walt Disney as the creator of lovable characters like Mickey Mouse and movies like “Snow White and the Seven Dwarfs” and “Fantasia,” Disney doesn’t get as much credit for his design of Disneyland. Turns out Disney made himself an expert on the subject. This podcast isn’t a typical Talking Headways conversation. It’s a 45-minute special feature episode, produced by Jeff for the Overhead Wire, on one topic: the history and ideas of Walt Disney the planner. Guests Sam Gennawey, an urban planner and author of three books on Walt Disney, and Tim Halbur, director of communications for the Congress for the New Urbanism, discuss in detail Walt’s focus on planning places for people in Disneyland, Disney World, and even Celebration, Florida. We hope you’ll take a listen and enjoy. We’ll be back next week with your regular dose of news and banter from Talking Headways. As always, you can subscribe to the Talking Headways Podcast on iTunes or Stitcher or by signing up for our RSS feed, and we always love hearing from you in the comments. Disney designed a Fantasyland where no one lives in places so far from the city that thy required a car to get to and huge parking lots. I’ve only read this post and not listened to the podcast. I hope it addresses how much Disneyland and Disney World resemble shopping malls. Now that I’ve listened, I can say that it is critical of Disney Corp. but is largely hagiography to Walt with blame for missteps placed mainly on the people working after his death. The sprawl caused by Disney isn’t mentioned. Walt Disney World opened in 1971, five years after Mr. Disney’s death. The Magic Kingdom of Disneyland is the most elaborate form of theatre ever devised. The audience is able to step through the proverbial proscenium arch or fourth wall and come onto the stage to interact with the players. The fiction is realized in physical permanence, and the guests are able to explore the imaginary settings in ways that are alternately participatory and controlled. As such, Disneyland should be regarded as a thing unto itself. It is instructive to the world of urban design, but the creation must be appreciated on its own terms as a medium for storytelling. Disneyland Paris has a high-speed rail station. Tokyo Disneyland has a metropolitan monorail station connecting the site to Tokyo proper. Hong Kong Disneyland has its own high-quality transit station. Anaheim is building ARTIC for California High-Speed Rail, Metrolink, and other modes that will be linked with Disneyland by way of the ARC streetcar. And, Walt Disney World was designed with: an on-site international airport; monorail and WEDway people-mover systems; and, the prospect of being connected to Florida’s attempts at high-speed rail. Are you trying to impress me that the American park that draws millions of people, has been around for over forty years and is twenty miles from the real Orlando airport has a prospect of someday being connected to an attempt at rail? Should I be impressed that the other American Disney park, which is nearly sixty years old is going to get halfway decent public transit to cover the thirty mile trip to LA? You should be impressed negatively that the United States dismantled so many of its high-quality transit systems over the last 60 years and positively that Mr. Disney was such a strong advocate for rail and other fixed-guideway systems that he even offered the City of Los Angeles the prospect of privately-operated monorail trains, which the municipality rejected. And, you should be positively impressed by the efforts of people in California and Florida, who despite facing some very powerful opposition, have been making significant attempts at improving transit in these places. Walt Disney Imagineering developed its WEDway PeopleMover system, which was sold to Houston International Airport, and the company was actively engaged in promoting monorails, as well, to American jurisdictions at a time when no one was investing in anything but automobile-dependent infrastructure. Incidentally, I worked at one time for The Walt Disney Company at its Anaheim plant, and I took Metrolink there every day. The Company paid half of my rail fare and gave me an additional monetary incentive to use an alternative to single-occupancy vehicles. I also received an expense account for taxis. The Metrolink/Amtrak station is approximately a mile away from Disneyland, and an express shuttle meets every arriving train to connect the sites. So, the linkages are currently convenient, but they are still being improved. Your criticism is misplaced and ill-informed. Here is the Pacific Electric Railway, which was the largest interurban streetcar system in the world until the network was completely-dismantled in the 1960’s. Anaheim is located along a branch line extending from the trunk line between Los Angeles and Long Beach. The dismantling of the PE started long before the 1960s. The last line, from LA to Long Beach quit in 1961, but some of the shorter lines were converted to bus service in 1923, and abandonments continued through the 30s, 40s and 50s. Just to be accurate, Anaheim was on a non-electrified Southern Pacific line. Regarding the “monorail” proposal: Monorails (more accurately “monobeams”) are useful in short-haul closed-loop operations, but they have many drawbacks when it comes to service in the “outside world”. 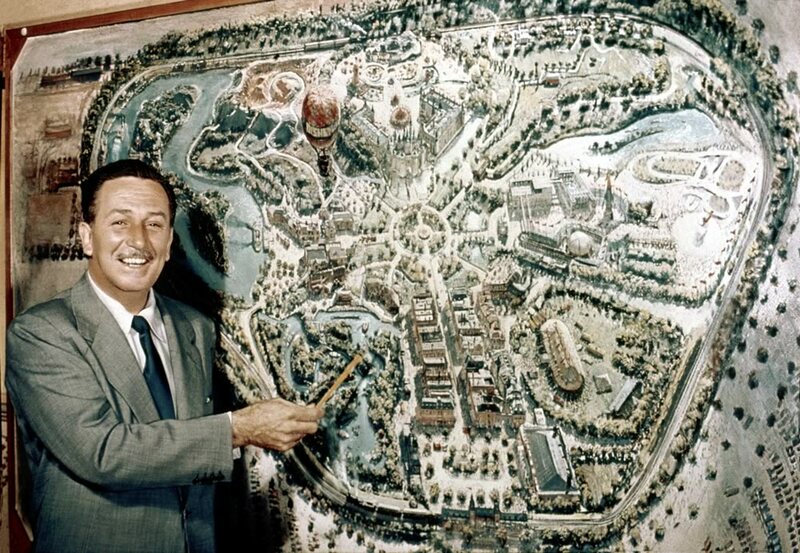 Walt chose Anaheim and central Florida because they were places with cheap land. That the places he selected adapted to his developments — first by building more roads and more recently by adding public transit (maybe) is the same pattern that we see with shopping malls across the country. The Disney theme parks, like any large development, are a mix of good and bad, Thank you for preemptively answering my question of whether you work(ed) for Disney. Your unfailing boosterism, despite the clear bad, had me wondering. Exactly. Disney urbanism in its entirety isn’t necessarily something to be emulated in the “real world”, but elements of it prove that people respond well to environments that cater to the human scale rather than the car scale. My “boosterism,” to use the term in your ad-hominem argument, is not for my former employer, which I am among the first to criticize on any number of levels. Instead, my argument is against the assertion that shopping malls, which had the effect of displacing retail in the mixed-use districts of real cities, are entirely different from a gated attraction and resort destination that is built principally to accommodate visitors from around the world on their, mostly-yearly, vacations. Moreover, because of the gated and expansive nature of Disneyland, former agricultural land is precisely the right kind to use for such unique development in order to avoid Jane Jacobs’ dreaded border vacuums. Tivoli Gardens in Copenhagen, besides residing on overly-expensive land, is too close to the city center, frankly. Coney Island is farther away, but it does happen to be situated at a subway station. In fact, the Pacific Electric, as well as many other streetcar businesses, operated recreational attractions at the outbound termini in order to counterbalance the peak demand of these services. Disneyland opened just as new freeways were being built and as trains and trolleys were being dismantled, and the place was certainly not responsible for that fact, despite your implication otherwise. Mr. Disney had also put every dime of his own into the endeavor, even liquidating his life-insurance policy and mortgaging his home, so land-acquisition costs had to be kept to a minimum. The site-selection process undertaken by researchers at Stanford University was exhaustive, so where else would you have put Disneyland? Do you have any hypothetical suggestions? Or, is your antipathy borne from some sort of other frustration with the place? And, do you make the same criticism of similar development? Exactly why is Disneyland worse than a Tivoli Gardens or Coney Island or an international resort? Once again, high-quality public transit, in the form of commuter rail, to Disneyland has been available for decades. The LA-Long Beach line was not a Pacific Electric Railway route – it was part of Los Angeles Railways, which, btw, was the transit company National City Lines operated. The PE is properly understood as an “interurban,” and while the LA-Long Beach line has those same characteristics, it was worked by PCCs run by LARy. Gated attractions, such as Disney World, that are built on such a huge scale are challenging for human-scale activity near their exteriors. When they die, large, gated developments can’t readily go back to agriculture but often are too far from population centers to be immediately attractive for redevelopment. Yes, there are differences between gated resorts and malls, but to hold a gated resort as an example for human-scale development doesn’t make sense to me. My “antipathy” toward Disney is that it has loyal followers who fawn over whatever it does and won’t see or say anything bad, especially about Walt. I would have the same reaction if “Disney” were replaced by “Costco” or some other brand that elicits that kind of response. No business can be a paragon of perfection in all things. As far as I can tell, by 1955, when Disneyland opened, Metropolitan Coach Lines had a bus to Anaheim, but the local trains (electric or not) were either gone or expected to be gone soon. The LA-Long Beach line was a Pacific Electric operation until 1953. PE sold its passenger business (which was mostly bus by then) to Metropolitan Coach Lines. In 1958, the LA Metropolitan Transit Authority bought out both Metro Coach and LA Transit Lines, which was the narrow-gauge streetcar and bus operation. As a one-off experiment, an LATL PCC car (with standard-gauge trucks borrowed from San Francisco) made a few trips on the Long Beach Line about a year before it was abandoned. The car rode poorly on the rough PE track and was soon restored to its narrow gauge trucks. PE had 30 PCCs, but they mostly ran on the Glendale-Burbank lines, never went to Long Beach, and were sold to an Argentine railway in 1959. It should come as no surprise that Disneyland employees who interact with guests are known as “cast members”. There's lots to unpack when you think about the impact of Walt Disney.